Windows Process Regulator is a fake security application from the same family as: Windows Expansion System, Windows Power Expansion, Windows Simple Protector, Windows Background Protector, Windows Lowlevel Solution, Windows Support System, Windows Emergency System, Windows Efficiency Magnifier, Windows Threats Removing, Windows Remedy, Windows Troubles Remover, Windows Troublesmaker Agent, Windows Servant System, Windows Defence Center, Windows Error Correction, Windows Debug System, Windows Efficiency Manager, Windows Performance Manager, Windows Troubles Analyzer, Windows Processes Organizer, Windows Privacy Agent, Windows Express Settings, Windows Optimal Tool, Windows Safety Guarantee, Windows AV Software, Windows Express Help, Windows User Satellite, Windows Problems Solution, Windows Optimal Settings, Windows Optimal Solution, Windows Care Tool, Windows Wise Protection, Windows Software Guard, Windows Software Protection, Windows Safety Protection, Windows Problems Protector, Windows Problems Remover, Windows Health Center, Windows Shield Center, Windows Antispyware Solution, Windows Risk Eliminator, Windows Universal Tool, Windows Utility Tool, Windows Security & Control, Windows Optimization & Security, Windows System Optimizator, Windows Optimization Center, Privacy Corrector, Privacy Guard 2010. This rogue displays fake warning messages pushing users to buy a license. 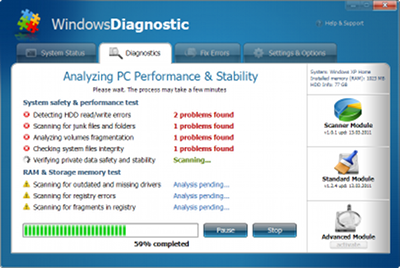 If your PC is infected with Windows Process Regulator use MBAM to remove the infection. Windows Expansion System is a fake security application from the same family as: Windows Power Expansion, Windows Simple Protector, Windows Background Protector, Windows Lowlevel Solution, Windows Support System, Windows Emergency System, Windows Efficiency Magnifier, Windows Threats Removing, Windows Remedy, Windows Troubles Remover, Windows Troublesmaker Agent, Windows Servant System, Windows Defence Center, Windows Error Correction, Windows Debug System, Windows Efficiency Manager, Windows Performance Manager, Windows Troubles Analyzer, Windows Processes Organizer, Windows Privacy Agent, Windows Express Settings, Windows Optimal Tool, Windows Safety Guarantee, Windows AV Software, Windows Express Help, Windows User Satellite, Windows Problems Solution, Windows Optimal Settings, Windows Optimal Solution, Windows Care Tool, Windows Wise Protection, Windows Software Guard, Windows Software Protection, Windows Safety Protection, Windows Problems Protector, Windows Problems Remover, Windows Health Center, Windows Shield Center, Windows Antispyware Solution, Windows Risk Eliminator, Windows Universal Tool, Windows Utility Tool, Windows Security & Control, Windows Optimization & Security, Windows System Optimizator, Windows Optimization Center, Privacy Corrector, Privacy Guard 2010. This rogue displays fake warning messages pushing users to buy a license. If your PC is infected with Windows Expansion System use MBAM to remove the infection. Windows Power Expansion is a fake security application from the same family as: Windows Simple Protector, Windows Background Protector, Windows Lowlevel Solution, Windows Support System, Windows Emergency System, Windows Efficiency Magnifier, Windows Threats Removing, Windows Remedy, Windows Troubles Remover, Windows Troublesmaker Agent, Windows Servant System, Windows Defence Center, Windows Error Correction, Windows Debug System, Windows Efficiency Manager, Windows Performance Manager, Windows Troubles Analyzer, Windows Processes Organizer, Windows Privacy Agent, Windows Express Settings, Windows Optimal Tool, Windows Safety Guarantee, Windows AV Software, Windows Express Help, Windows User Satellite, Windows Problems Solution, Windows Optimal Settings, Windows Optimal Solution, Windows Care Tool, Windows Wise Protection, Windows Software Guard, Windows Software Protection, Windows Safety Protection, Windows Problems Protector, Windows Problems Remover, Windows Health Center, Windows Shield Center, Windows Antispyware Solution, Windows Risk Eliminator, Windows Universal Tool, Windows Utility Tool, Windows Security & Control, Windows Optimization & Security, Windows System Optimizator, Windows Optimization Center, Privacy Corrector, Privacy Guard 2010. This rogue displays fake warning messages pushing users to buy a license. If your PC is infected with Windows Power Expansion use MBAM to remove the infection. Windows Simple Protector is a fake security application from the same family as: Windows Background Protector, Windows Lowlevel Solution, Windows Support System, Windows Emergency System, Windows Efficiency Magnifier, Windows Threats Removing, Windows Remedy, Windows Troubles Remover, Windows Troublesmaker Agent, Windows Servant System, Windows Defence Center, Windows Error Correction, Windows Debug System, Windows Efficiency Manager, Windows Performance Manager, Windows Troubles Analyzer, Windows Processes Organizer, Windows Privacy Agent, Windows Express Settings, Windows Optimal Tool, Windows Safety Guarantee, Windows AV Software, Windows Express Help, Windows User Satellite, Windows Problems Solution, Windows Optimal Settings, Windows Optimal Solution, Windows Care Tool, Windows Wise Protection, Windows Software Guard, Windows Software Protection, Windows Safety Protection, Windows Problems Protector, Windows Problems Remover, Windows Health Center, Windows Shield Center, Windows Antispyware Solution, Windows Risk Eliminator, Windows Universal Tool, Windows Utility Tool, Windows Security & Control, Windows Optimization & Security, Windows System Optimizator, Windows Optimization Center, Privacy Corrector, Privacy Guard 2010. This rogue displays fake warning messages pushing users to buy a license. If your PC is infected with Windows Simple Protector use MBAM to remove the infection. Windows Background Protector is a fake security application from the same family as: Windows Lowlevel Solution, Windows Support System, Windows Emergency System, Windows Efficiency Magnifier, Windows Threats Removing, Windows Remedy, Windows Troubles Remover, Windows Troublesmaker Agent, Windows Servant System, Windows Defence Center, Windows Error Correction, Windows Debug System, Windows Efficiency Manager, Windows Performance Manager, Windows Troubles Analyzer, Windows Processes Organizer, Windows Privacy Agent, Windows Express Settings, Windows Optimal Tool, Windows Safety Guarantee, Windows AV Software, Windows Express Help, Windows User Satellite, Windows Problems Solution, Windows Optimal Settings, Windows Optimal Solution, Windows Care Tool, Windows Wise Protection, Windows Software Guard, Windows Software Protection, Windows Safety Protection, Windows Problems Protector, Windows Problems Remover, Windows Health Center, Windows Shield Center, Windows Antispyware Solution, Windows Risk Eliminator, Windows Universal Tool, Windows Utility Tool, Windows Security & Control, Windows Optimization & Security, Windows System Optimizator, Windows Optimization Center, Privacy Corrector, Privacy Guard 2010. This rogue displays fake warning messages pushing users to buy a license. If your PC is infected with Windows Background Protector use MBAM to remove the infection. Windows Lowlevel Solution is a fake security application from the same family as: Windows Support System, Windows Emergency System, Windows Efficiency Magnifier, Windows Threats Removing, Windows Remedy, Windows Troubles Remover, Windows Troublesmaker Agent, Windows Servant System, Windows Defence Center, Windows Error Correction, Windows Debug System, Windows Efficiency Manager, Windows Performance Manager, Windows Troubles Analyzer, Windows Processes Organizer, Windows Privacy Agent, Windows Express Settings, Windows Optimal Tool, Windows Safety Guarantee, Windows AV Software, Windows Express Help, Windows User Satellite, Windows Problems Solution, Windows Optimal Settings, Windows Optimal Solution, Windows Care Tool, Windows Wise Protection, Windows Software Guard, Windows Software Protection, Windows Safety Protection, Windows Problems Protector, Windows Problems Remover, Windows Health Center, Windows Shield Center, Windows Antispyware Solution, Windows Risk Eliminator, Windows Universal Tool, Windows Utility Tool, Windows Security & Control, Windows Optimization & Security, Windows System Optimizator, Windows Optimization Center, Privacy Corrector, Privacy Guard 2010. This rogue displays fake warning messages pushing users to buy a license. If your PC is infected with Windows Lowlevel Solution use MBAM to remove the infection. CleanThis detects fake infections and prevents legit softwares execution, displaying alert messages to scare users. If your PC is infected with CleanThis follow bleepingcomputer's removal guide. Windows Emergency System is a fake security application from the same family as: Windows Efficiency Magnifier, Windows Threats Removing, Windows Remedy, Windows Troubles Remover, Windows Troublesmaker Agent, Windows Servant System, Windows Defence Center, Windows Error Correction, Windows Debug System, Windows Efficiency Manager, Windows Performance Manager, Windows Troubles Analyzer, Windows Processes Organizer, Windows Privacy Agent, Windows Express Settings, Windows Optimal Tool, Windows Safety Guarantee, Windows AV Software, Windows Express Help, Windows User Satellite, Windows Problems Solution, Windows Optimal Settings, Windows Optimal Solution, Windows Care Tool, Windows Wise Protection, Windows Software Guard, Windows Software Protection, Windows Safety Protection, Windows Problems Protector, Windows Problems Remover, Windows Health Center, Windows Shield Center, Windows Antispyware Solution, Windows Risk Eliminator, Windows Universal Tool, Windows Utility Tool, Windows Security & Control, Windows Optimization & Security, Windows System Optimizator, Windows Optimization Center, Privacy Corrector, Privacy Guard 2010. This rogue displays fake warning messages pushing users to buy a license. If your PC is infected with Windows Emergency System use MBAM to remove the infection. 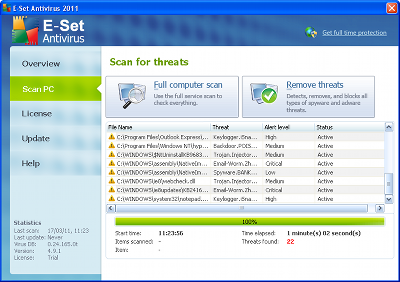 Fake E-Set Antivirus 2011 uses a real Antivirus solution name to mislead users. It also kept the AVG antivirus logo from the previous version of the rogue. This rogue is from the same family as Fake AVG Anti-Virus, Antivirus 8. 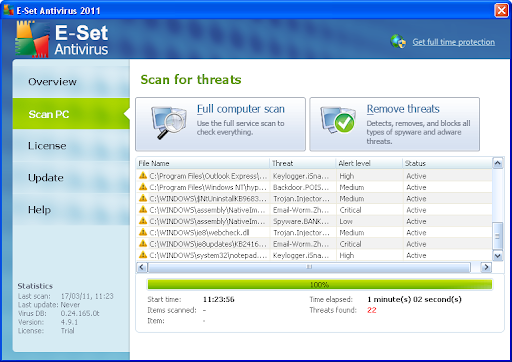 The Fake E-Set Antivirus 2011 detects and display fake infections to scare users pushing them into buying a license. 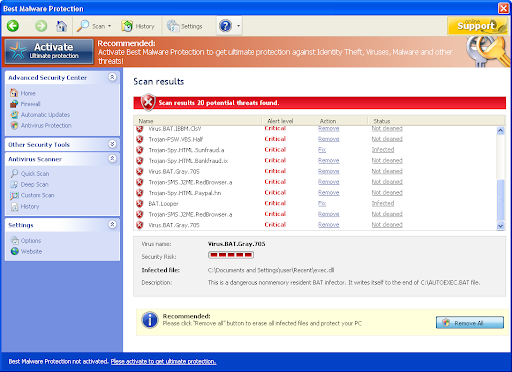 If your PC is infected with the Fake E-Set Antivirus 2011 use MBAM to remove the infection. Windows Threats Removing is a fake security application from the same family as: Windows Remedy, Windows Troubles Remover, Windows Troublesmaker Agent, Windows Servant System, Windows Defence Center, Windows Error Correction, Windows Debug System, Windows Efficiency Manager, Windows Performance Manager, Windows Troubles Analyzer, Windows Processes Organizer, Windows Privacy Agent, Windows Express Settings, Windows Optimal Tool, Windows Safety Guarantee, Windows AV Software, Windows Express Help, Windows User Satellite, Windows Problems Solution, Windows Optimal Settings, Windows Optimal Solution, Windows Care Tool, Windows Wise Protection, Windows Software Guard, Windows Software Protection, Windows Safety Protection, Windows Problems Protector, Windows Problems Remover, Windows Health Center, Windows Shield Center, Windows Antispyware Solution, Windows Risk Eliminator, Windows Universal Tool, Windows Utility Tool, Windows Security & Control, Windows Optimization & Security, Windows System Optimizator, Windows Optimization Center, Privacy Corrector, Privacy Guard 2010. This rogue displays fake warning messages pushing users to buy a license. 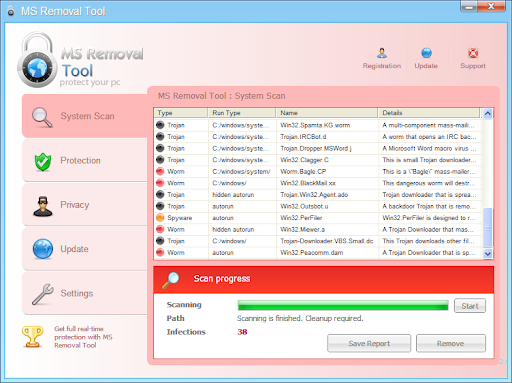 If your PC is infected with Windows Threats Removing use MBAM to remove the infection. 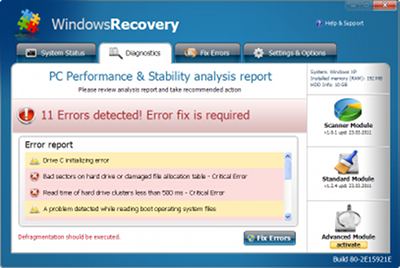 Windows Remedy is a fake security application from the same family as: Windows Troubles Remover, Windows Troublesmaker Agent, Windows Servant System, Windows Defence Center, Windows Error Correction, Windows Debug System, Windows Efficiency Manager, Windows Performance Manager, Windows Troubles Analyzer, Windows Processes Organizer, Windows Privacy Agent, Windows Express Settings, Windows Optimal Tool, Windows Safety Guarantee, Windows AV Software, Windows Express Help, Windows User Satellite, Windows Problems Solution, Windows Optimal Settings, Windows Optimal Solution, Windows Care Tool, Windows Wise Protection, Windows Software Guard, Windows Software Protection, Windows Safety Protection, Windows Problems Protector, Windows Problems Remover, Windows Health Center, Windows Shield Center, Windows Antispyware Solution, Windows Risk Eliminator, Windows Universal Tool, Windows Utility Tool, Windows Security & Control, Windows Optimization & Security, Windows System Optimizator, Windows Optimization Center, Privacy Corrector, Privacy Guard 2010. This rogue displays fake warning messages pushing users to buy a license. If your PC is infected with Windows Remedy use MBAM to remove the infection. Windows Troublesmaker Agent is a fake security application from the same family as: Windows Servant System, Windows Defence Center, Windows Error Correction, Windows Debug System, Windows Efficiency Manager, Windows Performance Manager, Windows Troubles Analyzer, Windows Processes Organizer, Windows Privacy Agent, Windows Express Settings, Windows Optimal Tool, Windows Safety Guarantee, Windows AV Software, Windows Express Help, Windows User Satellite, Windows Problems Solution, Windows Optimal Settings, Windows Optimal Solution, Windows Care Tool, Windows Wise Protection, Windows Software Guard, Windows Software Protection, Windows Safety Protection, Windows Problems Protector, Windows Problems Remover, Windows Health Center, Windows Shield Center, Windows Antispyware Solution, Windows Risk Eliminator, Windows Universal Tool, Windows Utility Tool, Windows Security & Control, Windows Optimization & Security, Windows System Optimizator, Windows Optimization Center, Privacy Corrector, Privacy Guard 2010. This rogue displays fake warning messages pushing users to buy a license. If your PC is infected with Windows Troublesmaker Agent use MBAM to remove the infection. Windows Servant System is a fake security application from the same family as: Windows Defence Center, Windows Error Correction, Windows Debug System, Windows Efficiency Manager, Windows Performance Manager, Windows Troubles Analyzer, Windows Processes Organizer, Windows Privacy Agent, Windows Express Settings, Windows Optimal Tool, Windows Safety Guarantee, Windows AV Software, Windows Express Help, Windows User Satellite, Windows Problems Solution, Windows Optimal Settings, Windows Optimal Solution, Windows Care Tool, Windows Wise Protection, Windows Software Guard, Windows Software Protection, Windows Safety Protection, Windows Problems Protector, Windows Problems Remover, Windows Health Center, Windows Shield Center, Windows Antispyware Solution, Windows Risk Eliminator, Windows Universal Tool, Windows Utility Tool, Windows Security & Control, Windows Optimization & Security, Windows System Optimizator, Windows Optimization Center, Privacy Corrector, Privacy Guard 2010. This rogue displays fake warning messages pushing users to buy a license. If your PC is infected with Windows Servant System use MBAM to remove the infection. 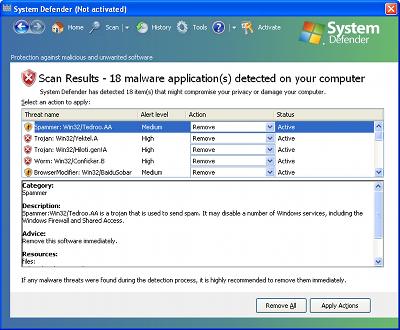 System Defender is a fake security application (rogue) from the same family as: Internet Defender, Security Defender, Antimalware Defender. It displays fake infections to push users into buying a license. 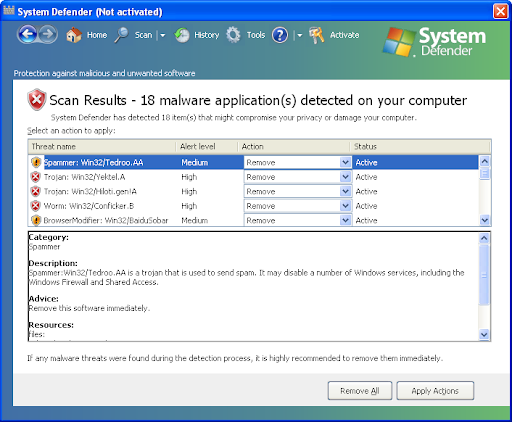 If your PC is infected with System Defender use MBAM to remove the infection. Windows Defence Center is a fake security application from the same family as: Windows Error Correction, Windows Debug System, Windows Efficiency Manager, Windows Performance Manager, Windows Troubles Analyzer, Windows Processes Organizer, Windows Privacy Agent, Windows Express Settings, Windows Optimal Tool, Windows Safety Guarantee, Windows AV Software, Windows Express Help, Windows User Satellite, Windows Problems Solution, Windows Optimal Settings, Windows Optimal Solution, Windows Care Tool, Windows Wise Protection, Windows Software Guard, Windows Software Protection, Windows Safety Protection, Windows Problems Protector, Windows Problems Remover, Windows Health Center, Windows Shield Center, Windows Antispyware Solution, Windows Risk Eliminator, Windows Universal Tool, Windows Utility Tool, Windows Security & Control, Windows Optimization & Security, Windows System Optimizator, Windows Optimization Center, Privacy Corrector, Privacy Guard 2010. This rogue displays fake warning messages pushing users to buy a license. If your PC is infected with Windows Defence Center use MBAM to remove the infection. 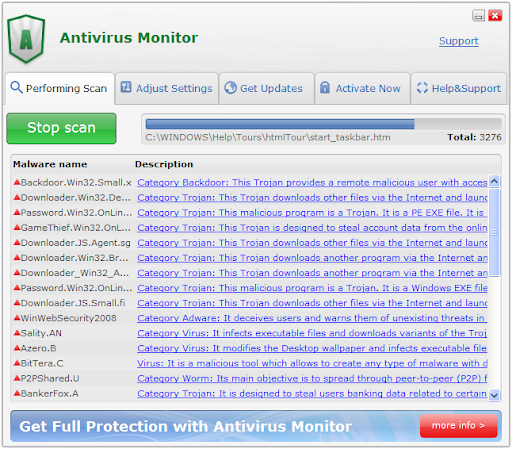 Antivirus Monitor is a fake security application (rogue) from the same family as AntiMalware GO, AntiVira Av, Antivirus .NET, Antivirus Scan. It displays fake infections to push users into buying a license. 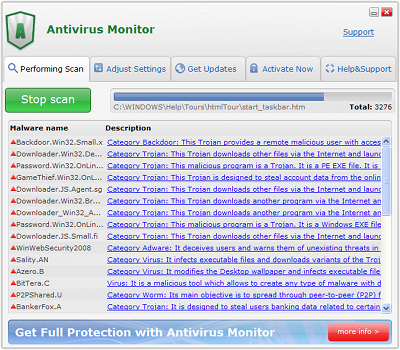 If your PC is infected with Antivirus Monitor use MBAM to remove the infection. Windows Debug System is a fake security application from the same family as: Windows Efficiency Manager, Windows Performance Manager, Windows Troubles Analyzer, Windows Processes Organizer, Windows Privacy Agent, Windows Express Settings, Windows Optimal Tool, Windows Safety Guarantee, Windows AV Software, Windows Express Help, Windows User Satellite, Windows Problems Solution, Windows Optimal Settings, Windows Optimal Solution, Windows Care Tool, Windows Wise Protection, Windows Software Guard, Windows Software Protection, Windows Safety Protection, Windows Problems Protector, Windows Problems Remover, Windows Health Center, Windows Shield Center, Windows Antispyware Solution, Windows Risk Eliminator, Windows Universal Tool, Windows Utility Tool, Windows Security & Control, Windows Optimization & Security, Windows System Optimizator, Windows Optimization Center, Privacy Corrector, Privacy Guard 2010. This rogue displays fake warning messages pushing users to buy a license. If your PC is infected with Windows Debug System use MBAM to remove the infection. 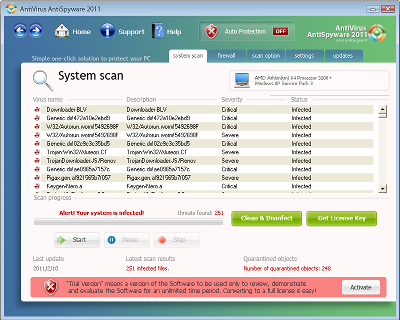 Antivirus Antispyware 2011 is a fake security software (rogue). It is from the same family as: AntiVirus System 2011, Security Inspector 2010, AntiVirus Studio 2010, Desktop Security 2010, Total PC Defender 2010, Desktop Defender 2010, Contraviro, UnVirex. Antivirus Antispyware 2011 displays a lot of disturbing warning messages pushing users to purchase a license.